- Publisher So many times you've tried to talk yourself out of the terror that gnaws within, but it hasn't worked. You're riddled with tension and guilt. You try to move forward, but unseen fears lurk around every corner, causing you to imagine the worst. You're frozen in your tracks, held captive by fear. But life doesn't have to be this way. You can live in confidence and peace. Using time-tested biblical principles, you can conquer your fears and walk in freedom. You can Make Fear Bow today! 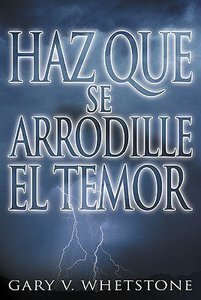 About "Haz Que Se Arrodille El Temor (Make Fear Bow)"
So many times you've tried to talk yourself out of the terror that gnaws within, but it hasn't worked. You're riddled with tension and guilt. You try to move forward, but unseen fears lurk around every corner, causing you to imagine the worst. You're frozen in your tracks, held captive by fear. But life doesn't have to be this way. You can live in confidence and peace. Using time-tested biblical principles, you can conquer your fears and walk in freedom. You can Make Fear Bow today!